We are Practical Tactical, the personal preparedness strategists. OUR MISSION: To help you establish a practical disaster preparedness plan for you and your family. A while back I wrote to you asking the infinitely crucial question, “Are you paying attention?”. In that moment, I was referring to the hellish events that were taking place in Japan in the immediate aftermath of a record setting earthquake that had shifted the Earth’s axis, had triggered a devastating tsunami and subsequently a nuclear disaster at the Fukashima nuclear power plant. Since then the world has turned several times and the disasters just keep coming…devastating floods, tornadoes and SuperStorm Sandy to name just a few. Today I wanted to bring the focus down a level or two and focus on why we need to be prepared to respond to an emergency every day, out and about or at home, at any hour of the day. Currently we find ourselves witnesses to another week of disaster as we’ve seen Canada get ravaged as Toronto was thrown into chaos after four hours of intense rains led to incredible flash flooding, cutting power to up to 400,000 in Canada’s largest city. A small town in Quebec, Lac-Megantic, was eviscerated when the night exploded just after midnight as a train derailment involving more than seventy tanker cars carrying crude oil sparked an incredible fireball THAT COULD BE SEEN FROM SPACE! For the record, a rail car can carry roughly 700 barrels of oil, with 42 gallons per barrel. That’s a lot of crude. Some victims were likely vaporized by the intense blaze, which burned for 36 hours after the crash. Back here in the States a line of severe thunderstorms raced through the Ohio River Valley yesterday, causing numerous power outages due to downed trees and power lines. The damage and duration of the storms were enough to qualify the system as a derecho. 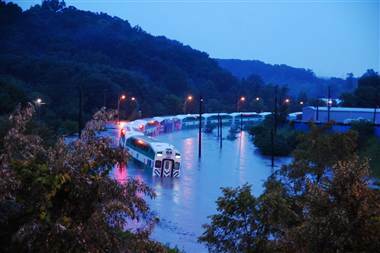 An area in the Ohio and Tennessee Valleys from eastern Illinois and Indiana into Ohio, western Pennsylvania, southwest New York, and northern West Virginia were impacted by the July 10 storms. 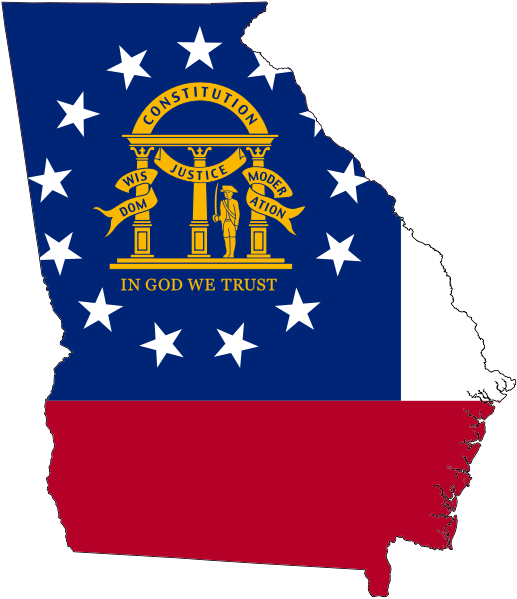 All of this happened to my north as the crow flies as I sit here in Georgia, but that does not mean it cannot happen here tomorrow…or later today. The flooding in Toronto comes on the heels of recent flooding in Calgary that forced up to 100,000 Albertans from there homes. The downpour of 3.5 inches of rain in less than four hours forced subway closures and left almost 1,500 people stranded on a commuter train filled with gushing water, while countless motorists were forced to abandon their vehicles to flee the rising waters. Subway passengers spilled out of the train cars and fled to the upper decks, where they waited for almost seven hours to be rescued. The sleepy Quebec town of Lac-Megantic, located about 160 miles east of Montreal and close to the border with Maine and Vermont, was rocked in the middle of the night on July 6 when a train carrying crude oil jumped the tracks and careened into the town of 6,000 residents unleashing hell on earth. In a town that small, most everyone is affected by the deaths and destruction. Prime Minister Stephen Harper has described the scene as a “war zone” while others have referred to the landscape of the aftermath as a crematorium. From a CNN report, “Notices were placed on doors instructing residents how to clean and air out their homes. 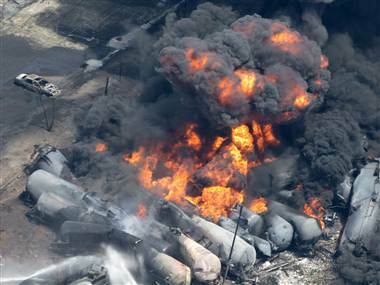 Officials suggested throwing out any food and boiling all water because the city’s water treatment plant is not operational.” In what is Canada’s worst railway catastrophe in almost 150 years, the death toll has risen to 50 as a result of the fiery crash of the runaway oil train. This incident forces us to focus on the safety of future rail shipments of oil (as well as proposals such as the XL Pipeline and other fossil fuel transportation methods) as demand for such services is certainly increasing. Check this out for a more thorough look at these issues. In a “does this sound familiar” moment, a destructive derecho ripped its way across the Ohio and Tennessee Valleys yesterday. Though not as destructive as the storm that plowed all the way to the east coast and decimated parts of Washington D.C. in 2012, this derecho produced roughly 300 reports of either wind damage or high winds that knocked out power to thousands across seven states. Just in case you needed some more motivation to get your preparedness house in order, I hope this fits the bill. Disaster does not stick to our daily schedules and can kick down your door any time of day or night. Do you have a plan? Will you be ready? If you’re unsure, today is the perfect time to get started and figure it out. B.O.L.T. GEAR, BOB, Bug Out Bag, Canada, disaster, EDC, emergency, energy, Every Day Carry, explosion, extreme, FLOOD, flooding, Get Home Bag, Get Out Of Dodge, GHB, GOOD, oil, peak oil, personal preparedness, prepare, preparedness, PREPPERS, preppertalk, prepping, shtf, survival, weather. Bookmark. LIKE AND FOLLOW PRACTICAL PREPPING. PERIOD. ON FACEBOOK! #NATIONMAKERS : LIKE AND FOLLOW TODAY! GET YOUR COPY OF THE QSG TODAY! As a member of #PracTacNation you have resolved to remain "Always Ready" to take care of yourself, your family and be a positive force in your community. Well done! 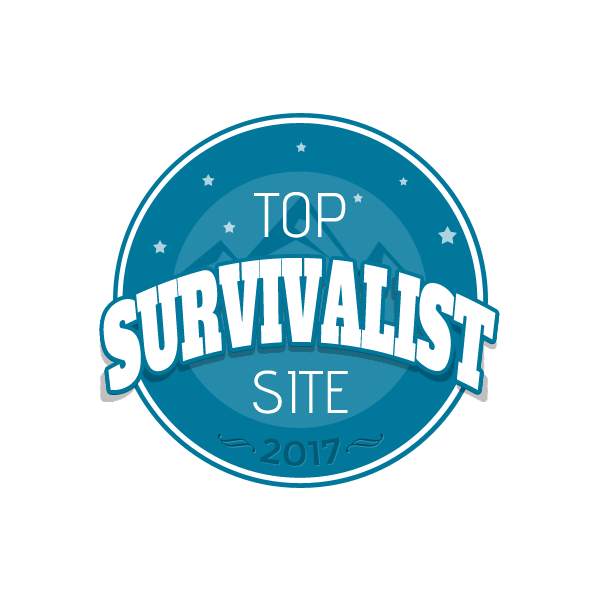 Copyright 2008 - 2014 PRACTICAL TACTICAL Website. All rights reserved. This site may contain copyrighted material the use of which has not always been specifically authorized by the copyright owner. I believe this constitutes a "fair use" of such material under Title 17, U.S.C. § 107. If you wish to use copyrighted material from this site for purposes that go beyond "fair use," you must obtain permission from the copyright owner(s).